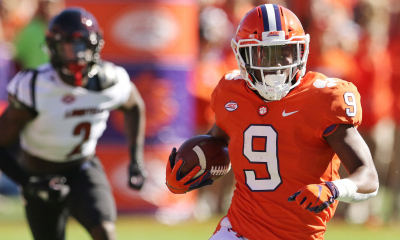 Clemson University tailback Travis Etienne continued to present his credentials as a legitimate Heisman Trophy candidate on Saturday, rushing 10 times for 167 yards and three touchdowns in limited duty during the Tigers’ 63-3 beatdown of Wake Forest. 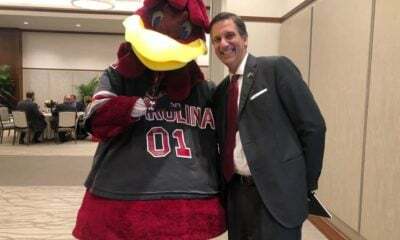 And while Etienne probably won’t be striking a pose with big-name quarterbacks like Tua Tagovailoa and two-sport star Kyler Murray putting up ridiculous numbers this season, he has been a steadying force for the fourth-ranked Tigers (6-0, 3-0 ACC) in their bid for a fourth straight trip to the College Football Playoff (CFP). Through six games, Etienne has now amassed 761 yards and 11 touchdowns. The 5-foot-10, 200-pound sophomore from Jennings, Louisiana is averaging 9.2 yards per carry and 126.8 yards per game. He has also hauled in five passes for 23 yards and another score. 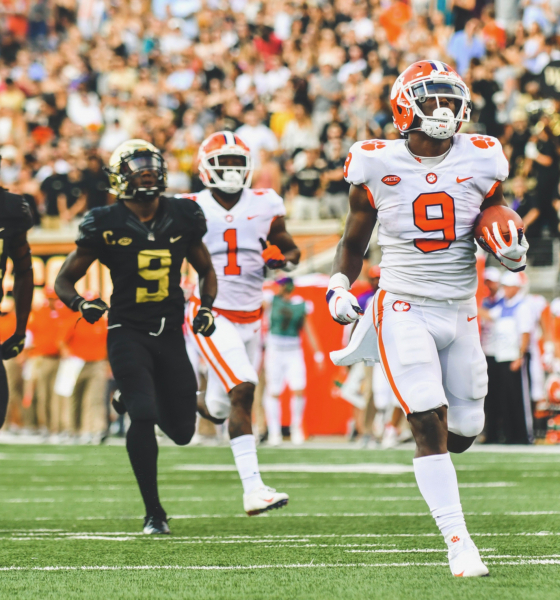 Etienne’s emergence is quickly becoming the big story in Tiger Town, where much of the early part of the season has been spent dealing with quarterback drama. There was no drama of any kind under center against the overmatched Demon Deacons, though. True freshman Trevor Lawrence – knocked out of last week’s game against Syracuse – returned to the starting lineup and completed 20 of 25 passes for 175 yards and a pair of touchdowns. Lawrence (above) looked no worse for the wear following a savage hit from Orange defensive back Evan Foster a week ago. 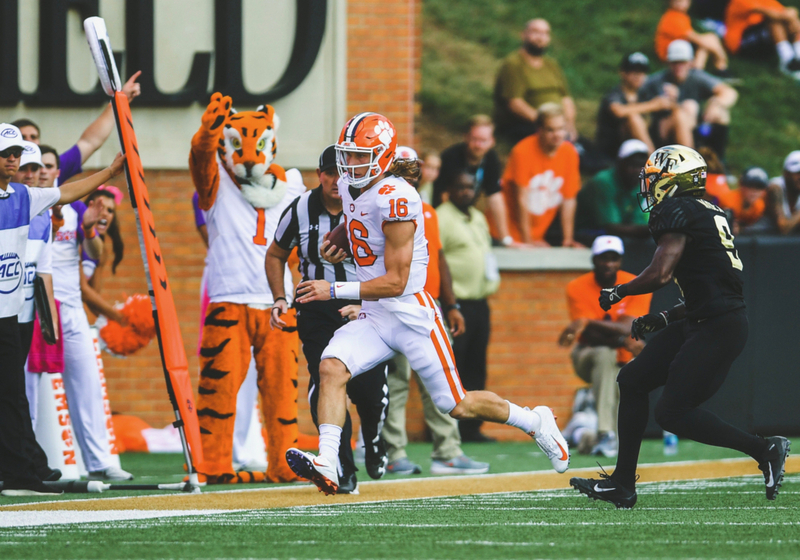 The 6-foot-6, 215-pound signal caller – playing on his nineteenth birthday – moved to 2-0 since taking over the starting job from graduate senior Kelly Bryant, who left the program two weeks ago. 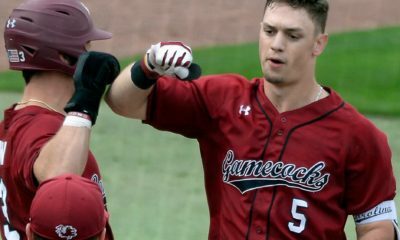 Through six games, the former No. 1 national recruit has completed 69 of 100 passes for 868 yards with 11 touchdowns and only two interceptions. But the big story from BB&T Field in Winston-Salem, N.C. was Clemson’s gashing ground game. In addition to Etienne’s big day, freshman tailback Lyn-J Dixon ran ten times for 163 yards and a pair of scores, while senior graduate Adam Choice added 128 yards on ten carries and a score. All told, Clemson amassed 471 rushing yards on 40 attempts – en route to 698 yards of total offense. It was a fitting tribute for the late C.J. Fuller, the former Tiger tailback who passed away earlier this week after he collapsed during a physical therapy session. 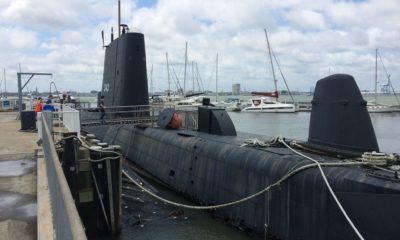 Fuller was 22 years old. 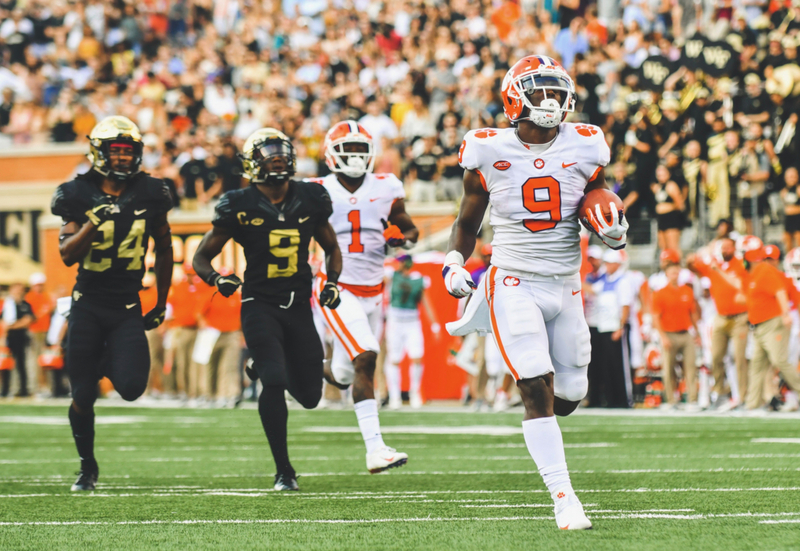 Defensively, coordinator Brent Venables’ unit was every bit as dominant – limiting Wake Forest to just 77 first half yards. Junior linebacker Tre Lamar had a huge day for Clemson, recording six tackles and a pair of sacks. 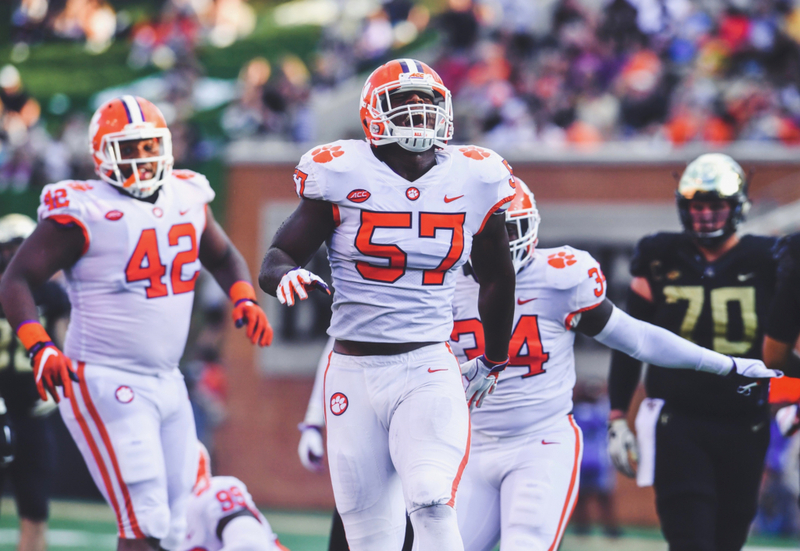 Clemson is 6-0 for the fourth straight year, and with the exception of an October 20 showdown against undefeated North Carolina State – currently the No. 23 team in the nation – there are no ranked opponents on its regular season schedule. 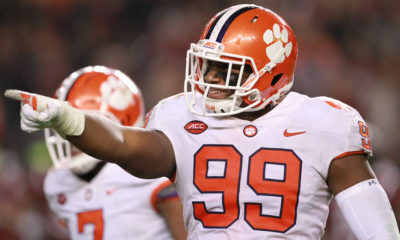 That sets up the Tigers nicely for another CFP run, however it probably won’t help Etienne as he makes his Heisman case. After Benny Snell Jr. of the Kentucky Wildcats struggled in his team’s overtime loss to Texas A&M on Saturday, there is a case to be made that Etienne is the best tailback in America (well, along with Darrell Henderson of Memphis). But Tagovailoa, Murray and West Virginia’s Will Grier are likely to continue providing sufficient firepower to keep this year’s race a quarterbacks-only affair. Clemson – which began the season ranked No. 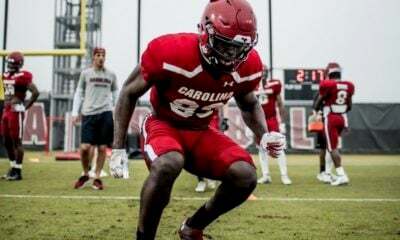 2 but has slipped in recent weeks – is off next Saturday, giving Swinney and his staff an extra week to get healthy and game plan for the Wolfpack (5-0, 2-0 ACC).